TORAFU ARCHITECTS is delighted to introduce our design projects‘NEOREAL WONDER – The World of Canon Digital Imaging’ and Kaneka ‘BAR x JAPAN x OLEDs – Attractive Bars in Japan’, at theupcoming Milano Salone (Salone Internazionale de Mobile), which celebrates its 50th anniversary this year. In addition, we will be having an ” airvase ” Exhibition at Spazio Rossana Orlandi, one of the prestigious galleries in Milan. ‘Light Loom’ is a space designed by TORAFU ARCHITECTS in collaboration with visualdesign studio WOW　whose work is title ‘Circle of light’ . Our wish is to complete a space where images can be projected at a scale, and in a way never attempted before. We invite you to visit by all means, and experience the space. Completely immersed in light and images, visitors to the Canon exhibition space can experience moving images in a whole new way. Though it is a screen made from countless strings, the ‘luminous flux screen’ is as immaterial as air, and upon which images projected from a light source can be traced. We thought of making a three-dimensional screen which unlike projections onto a flat screen, would allow visitors to have an experience within the actual projected images. Our idea was inspired by spools of strings found in spinning mills. The ‘luminous flux screen’ is unique from an ordinary screen in that it is able to capture light from various directions, leading visitors to a visual experience like never before. Our work aims to communicate the idea of an elusive reality associated with modern times. 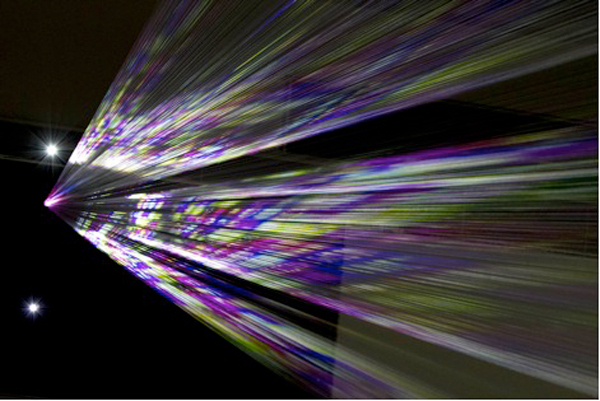 Neither virtual nor real, the ‘Light Loom’ gives form to what is actually formless. 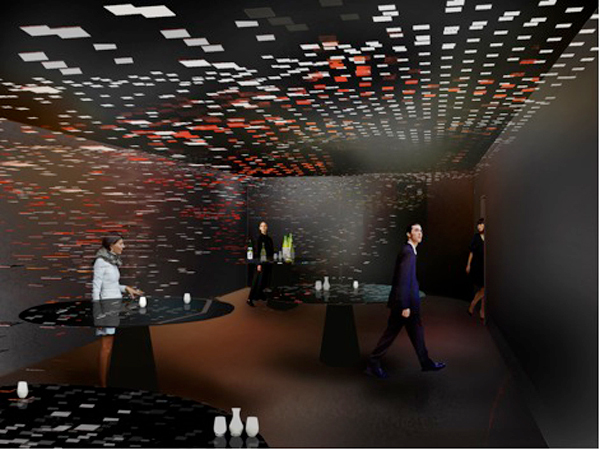 TORAFU ARCHITECTS have teamed up with lighting designer Izumi Okayasu to create an exhibition and drinking space which showcases organic light-emitting diodes (OLEDs), a new lighting product made by Kaneka Corporation. Throughout the two floors of the gallery, the OLEDs are displayed such that the amazingly thin and lightweight qualities of the product can be easily appreciated by visitors. Using organic light-emitting diodes (OLEDs), a next-generation light source, the main exhibition space we have designed for Kaneka depicts a scene of yozakura. A Japanese custom, it is the night time viewing of cherry blossoms which bloom abundantly in Japan every spring. In an attempt to share a beautiful scene of yozakura with visitors to Milano Salone, we have arranged the thin and lightweight OLEDs to delicately illuminate the space, as if they are floating in the air like cherry blossom petals lighting up the spring night sky. This will be the first overseas exhibition of Torafu’s very own ” airvase ” . The gallery space will be expressed in many forms and variations, and furthermore at this occasion we are planning to exhibit two brand new versions of ” airvase ” . We hope to have an ” airvase ” exhibition here never before.